Grandmother Twylah Nitsch, Wolf Clan Grandmother of the Seneca Tribe, teacher and mentor to Venus Rising founder and co-director, Star Wolf, passed into the other world on August 21, 2007 at 7:12 am EDT. Following is a letter from Star Wolf, written a few days after Grandma Twylah's passing about the magical events of that day, while Star Wolf was co-facilitating a Venus Rising 8-day healing and training intensive in Portland, OR. My heartfelt thoughts and prayers are with you and all those who know and love Grandma Twylah. As you might guess, Gram has visited me many times over the last few days and nights, filling me with many teachings while also activating my heart and soul with her humor, grace, dignity, love and wisdom. She has brought me tears of grief and joy over and over again with her shining presence. Everyone here at Still Meadows Retreat Center has felt her presence and many have received messages from Gram. 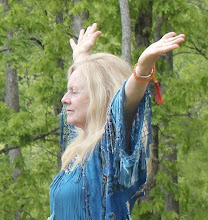 She came to some people through the Shamanic Breathwork ™ Process experienced on the morning of her passing and to others through dreams and visions. I must share with you some of the magic that occurred on the morning of her passing. Around 4 am west coast time I awoke with a start and began to vibrate as if electricity was running through my body. I had the distinct feeling that someone or something was calling me to go outside and walk down a path in the forest to visit the two 900 year old Douglas Fir trees (one is a Grandmother and the other a Grandfather) here in this sacred forest. Over 70 acres of natural land, creek and forest have been preserved by the Emissaries of Light at the Still Meadows Retreat Center near the Clackamas River. As is known by my friends, I am not typically a morning person so I decided to wait until the rain slowed down and it became light enough for me to make my way into the woods without getting lost. Around 6 am I began to walk to these trees that stand at least 70 feet tall while a gentle rain fell. I was overcome with a profound sadness that I could not explain. It was as if everything I had ever felt sad about came up to meet me on my walk to the trees; all the losses of my life were palpably present. I felt sadness about my aging mother and father and my father's failing health. I felt sadness that someday my beloved husband and I would be physically parted from each other by death. I felt sadness that I could not protect my son and my grandchildren from the pain and suffering of their trials and tribulations. Then I felt the grief of knowing that I am only one person doing what I can to stay awake and assist the people of the world to open their own hearts to deeper healing, wisdom and love, hoping that it is not too late to restore balance to our beloved planet. All of this was filling up my being as I walked to the great old ones who stand so nobly on this sacred land. When I arrived at the trees, I first went to the one that had told me that she was the Grandmother of the forest and I wept deeply. As the tears streamed down my face, I felt myself being emptied of all the grief that had filled me as I had walked to the old ones. I cried until I felt not only empty but wholly cleansed. I then flashed on Grandmother Twylah and my own maternal Grandmother Callie, two of the most important and influential people of my life. I felt their loving presence guiding me. I then walked a few feet away to the other gentle giant who had made me aware that he was the Grandfather and partner to the Grandmother tree. I found myself saying aloud, "Please, Great Ones, help me to stand tall and strong with dignity, speaking my truth, living with integrity, sharing what I have learned and my gifts with the world in a good way. Help me to weather the storms of life as you have, and to grow upright reaching to the stars and putting down strong roots to both nourish my life and soul as well as the lives of those around me. Help me to keep my heart open, alive and awake, and to renew it over and over again, never becoming stagnant or dulled with my own complacency. Help me to not be overwhelmed with the negativity of what may be occurring in the world around me." I felt an amazing vibration of renewed energy pouring through my heart center and knew I was being initiated and healed by these great beings in the woods and by the spirits that were present. I plucked two hairs from my head and offered one to each of the great trees and proceeded on my walk. I was guided out from the woods, across the field and past a huge stand of bushes filled with blackberries. I've never seen so many ripe, luscious berries, and I couldn't resist having breakfast right there in the field. I continued my walk, now moving deep into woods that looked much like a primeval forest. I would not have been surprised to see a brontosaurus munching on ferns and the moss that hung from the tall tree limbs. I slowly made my way down the side of a beautiful creek bank on old worn slippery steps. I was reminded of the creek behind the pasture and woods at Grandma Twylah's house on the Cattaraugus Reservation outside of Buffalo, N.Y. Many years ago Gram sent me to the river to spend the day in search of healing stones. She gave me very specific instructions on how to find them and told me to bring them back for her inspection. She taught me to notice how many sides the stones had, told me what their numerology was, and how to listen to the message hidden deep inside their ancient bodies. She then told me to sit outside all night by a small fire circle that was partially hidden and encircled by dense trees. I sat with the stones, my elder teachers, under the moon and a night sky filled with more stars than I had ever seen. I listened to the stones as they gave me their wisdom teachings. I now found myself gathering healing stones in the manner that Gram had taught me so many years ago. I felt like a happy child gathering the stones and listening to those that called me, joyfully hopping barefoot in the creek. Suddenly I had a sensation that I often have when something wants to download into my conscious awareness from another realm. I closed my eyes and stood still in the middle of the creek - for how long I don't know. It was then I saw a large wheel of light and a blue star. The blue star was pulsing and I heard a voice that instructed me to build a new type of healing / transformation wheel. I asked if it was a medicine wheel and was told "yes", but it was not to be called a medicine wheel. 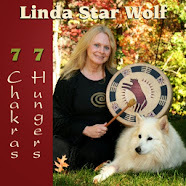 It was to be called the Blue Star Shamanic Wheel of Transformation." I was told it was representative of the Aquarian Shaman Energy that has been birthing onto the planet through Venus Rising and other organizations and individuals. It would serve as a guiding path to deeper healing and transformation and provide a map for the cycles of change to many people who would come to walk, meditate, pray, or do ceremony within the wheel. Once familiar with the wheel individuals can hold it in their awareness through imagination and receive the same effects. I became very excited as I returned to my outer awareness and couldn't wait to get back to my husband Brad and share all that had happened on my unexpected early morning vision quest. I told him about my morning and he too became excited. 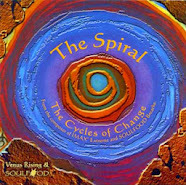 We realized that we wanted to bring this message to our group that, synchronistically, happened to be here for our once-a-year training on the five cycles of change – "The Alchemy of Transformation." We asked for and were given permission for our group to build the first Blue Star Wheel here at Still Meadows. I then returned to my room to prepare for the morning Shamanic Breathwork ™ Journey. I uncharacteristically decided to quickly call my home phone to see if there were any messages - something I usually do at the end of the day while traveling. There on the voice mail was an urgent message to call Grandma Twylah's son and daughter-in-law, Bob and Lee. My heart raced as I shakily called and learned of Gram's passing. While I spoke with Lee, it slowly dawned on me that it was Gram Twylah who had awakened me in the wee hours before dawn and called me to the elder trees and the elder stones in the creek. She always spoke so lovingly and respectfully of the trees, the stones, the creek beds and the animals. I realized the grief I had been feeling was deeply connected to her passing and the inner knowing that all things and beings must eventually pass from this reality into the Great Mystery. It was her voice that had come to me, along with the voices of the great trees, to reassure me and guide me back to my renewed vision and heart, and my commitment to the path I chose – or perhaps I should say chose me - so long ago. It was her words that reminded me to live in trust, standing tall, and to have the courage to speak the words of truth and living wisdom learned from the cycles of change and from the sacred experiences of life. It was her voice that reminded me that there is a well worn spiral path from this reality to all other dimensions and from Mother Earth to the Great Star Nations. And it was her voice that spoke to me as I stood in the sacred waters of Richardson Creek among the ancient stone Grandmothers and Grandfathers. It was she who instructed me to create a wheel that would incorporate the best of the old ways with the new teachings that are emerging as we enter the age of the Aquarian Shaman. Lee told me that a ceremony was to be held for Gram. It would happen while our group here would be doing a Shamanic Breathwork ™ Journey. I told her we would call in the energies here and that we would connect our ceremony for Grandma Twylah with theirs. In circle I tearfully shared the news of Grandma Twylah's passing and my bitter sweet shamanic experiences of the morning. The group was profoundly touched and went into their breathwork journeys carrying with them the magic of all that had happened. Much to my chagrin we could not, no matter how many times we tried, get our pre recorded music to play. We couldn't get any cd to play on the CD player, except one – "Sacred Spirit", the only Native American music cd that we had brought with us. Every time Brad hit "disc 1" on the cd player it would flip to "disc 4" and start to play "Sacred Spirit." We even took it out of the CD player and tried other cds in the disc 4 slot, but nothing else would play! Finally I looked at Brad and told him, "Nothing is going to work, except 'Sacred Spirit.' Gram is here. A few minutes ago we invited her spirit to join us for our breathwork and this is the music SHE WANTS US TO PLAY FOR HER!" Sure enough - as soon as Brad put "Sacred Spirit" back into slot number 4 it played just fine and so it is the cd we used for the entire session. Almost everyone in the group had Grandma Twylah visit them during their breathwork journey with some sort of message - some quite humorous I might add - all deeply meaningful. Magic also happened back in North Carolina at Venus Rising and the Isis Cove Community. I had quickly called my son Casey to let him know of Gram's passing and asked him to let the folks there in our community know about the 2 pm EDT ceremony. Below is an the email I received later that day from Ruby Falconer, Isis Cove community member and Venus Rising colleague. I did get your message regarding Grandma Twylah's passing. Kathy, Windraven, Karen and I gathered on the deck at 2 pm to hold space for her. Just as we were gathering it started to thunder. We smudged, and then stood together, holding hands, and each of us gave thanks to her for the work she did while on this earth and for the gifts she gave to us. None of us had met her in person, but we all feel indebted to her for the teachings she's given us through you, through the Medicine Cards and the Sacred Path Cards and in so many ways. We thanked her sincerely from our hearts. 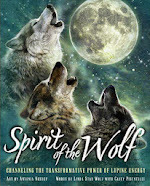 We thanked her for the Wolf Clan, and I told her that we are the Aquarian Wolf Clan - that we are the ones who will carry her teachings into the new age and that we will not let her teachings die. We thanked her for Isis Cove and told her that we believed that Isis Cove exists because of her and the teachings she gave you. We thanked her for everything she's given to us through you. Kathy pointed out that we had chosen, without thinking about it, to gather on the deck, where the Wise Wolf Women had gathered. And then we gave her a really big wolf howl. And Star Wolf, it poured rain, and the skies cracked open in huge peals of thunder as though the Thunder Beings were welcoming her soul and acknowledging our prayers. It truly was amazing. We felt your presence and everyone in Portland, and we felt the presence of other Wolf Clan members - many of whom we do not know in person - scattered all across this country and the world. And it poured rain. Later on that day Casey called and told me about the miracle of the rain, which had not been predicted in western North Carolina. Our area has been experiencing a drought for many weeks. He was convinced that Gram Twylah had something to do with it. Casey said, "Mom, right at the time all the ceremonies were happening on both sides of the country for Gram, I went out to look up at the sun and send Grandma Twylah and you some energy. These huge clouds gathered. It thundered, the sky broke open and it poured rain like crazy. Then the clouds dispersed and the sun came back out almost as suddenly as it disappeared and it has been sunny ever since." In his words, "It was really amazing. " Since then the emails and phone calls have been pouring into Venus Rising. The magic is still continuing here at Still Meadows Retreat Center where we are in deep process as we journey with the cycles of change and the Shamanic Breathwork ™ Process. I must close now as I go to teach again this afternoon and I will speak about the wheel that is permeating my every thought and vision. Gram woke me up again early this morning - this time I recognized her immediately. She came to tell me more about the Blue Star Wheel and how she wants us to build it. She, as always, has very specific instructions as to how it is to be done. I have always felt a strong heart connection with Gram, but now it is as if we have gone from dial up to wireless! Yes, I feel the deep sadness of her passing from this physical plane. I simultaneously feel a deepening of her love and wisdom in my heart that I know will continue to grow. Grandma Twylah and her vision, her spirit, her teachings and her magic is alive and well in the hearts of all those who love her. Those of us she called her "wolfies", her family members, students, friends and Wolf Clan Soul Family members who were fortunate enough to have heard her coyote laughter and see the twinkle of her eyes can say we truly have been blessed. For now I must go and teach and I know Grandma is close by whispering in my ear and I will tell the group some of her favorite words. Don't forget to trust ... Remember Trust has an "us" in it … We weren't meant to do it alone ... So All For One - One For All! In loving Memory of Grandmother Twylah.